This traditional style chair is a stylish and comfortable addition to your home with pleated rolled arms, attached back cushions and low bun feet. 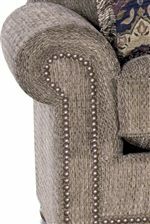 Nailhead trim along the front, back, and down the arms is optional and lets you create a chair that is perfect for your personality and home. With multiple options for the leather or fabric upholstery, this chair is a great piece to use in your living room, study or home office. 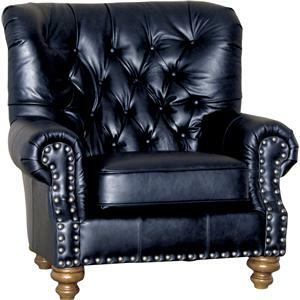 The 2900 Traditional Chair with Rolled Arms and Nailhead Trim by Mayo at Olinde's Furniture in the Baton Rouge and Lafayette, Louisiana area. Product availability may vary. Contact us for the most current availability on this product. 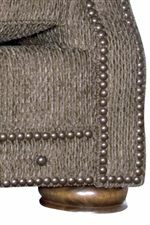 Arm Pleated rolled arms with nailhead trim. Leg or Skirt Finished wood low bun feet. Padding & Ergonomics Only the highest quality seat cushion is used on Mayo products for a stylish appearance and long lasting comfort. Seat cushions use a 2.0 pound high density polyurethane foam that is fabricated inside factory to maintain the highest quality assurance standards. This living room collection brings you stylish pieces that are perfect for an update to your traditional style home. Use a sofa or loveseat (not shown) to update a living room or sitting room while the chair and ottoman set is great for a library or study. 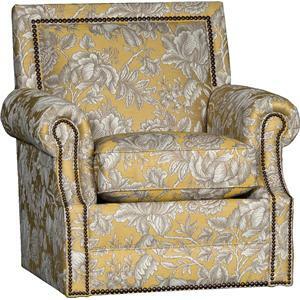 Nailhead trim options along the arms, back and front complete the look of the pieces. Choose between fabric and leather options to let these pieces completely match your home and style. The 2900 collection is a great option if you are looking for Traditional furniture in the Baton Rouge and Lafayette, Louisiana area. Browse other items in the 2900 collection from Olinde's Furniture in the Baton Rouge and Lafayette, Louisiana area.